Probably the most riveting aspect of sports is the ability of the narratives that surround them shift and flex, reverse and bend back upon themselves with an unpredictability that neither admittedly scripted, nor “reality” programming can touch. Rafael Nadal came into Roland Garros with a head of steam. His title runs in Monte Carlo, Barcelona and Rome looked downright pedestrian given the beatdowns he would inflict once he reached claycourt tennis' biggest stage. The King of Clay flat-out embarrassed some of the world's best clay court players. To wit, the following Nadal scorelines: versus World No. 13, Juan Monaco 6-2, 6-0, 6-0; versus World No. 6, David Ferrer 6-2, 6-2, 6-1, what else ya got, his snarl seemed to chuckle as he romped through the field. Then suddenly, the man whose serve had been broken once all tournament was broken…and broken…and broken over and over again, seven times in all. At one point, Nadal went from leading by 2 sets and a break to dropping eight straight games (or a set and a break) to World No. 1 Novak Djokovic. Fitful, frustrated and feeling his grip on the match slipping away, Nadal’s old friend, the rain, intensified. Fitful and frustrated with the turn of events, he and Djokovic left the court, for the night as it turned out. Once they returned it took Nadal just over 50 minutes to win French Open No. 7, halt Djokovic’s bid for four majors in a row and increase his own majors tally to 11. Maria Sharapova came to Paris with the wind at her back as well. She had warmed up with titles in Stuttgart and Rome, things looked great for her to finally conquer Paris...except she was drawn to face a fit and focused Serena Williams if she reached the final eight. Before the tournament even reached its stride, that specter was erased in a topsy, turvy match that left Williams a shocking 4-for-4 in poor showings (for her) at majors. Serena's shock loss to Virginie Razzano eased Sharapova's path, while on the other side of the draw, a player who had never before advanced past the third round of a major was doing the hard yards herself. Italy's Sara Errani knocked off two recent Roland Garros champions just to face another recent finalist for good measure in the semis. Sara Errani wasn’t through though, she won her way all the way to the final before finally being outcompeted by a determined Sharapova. Nadal and Sharapova, as we predicted, are your Roland Garros champions...so what does it all mean? Keep reading. With 16 time major champion Roger Federer beginning to succumb to Father Time, this seemed for all the world to be pencilled in as the era of Rafa Nadal. That said as far as tennis eras go, Nadal hasn't exactly fared poorly. Of the last eight majors played, Nadal has buggy whipped his way to the finals seven times. That's nearly Federerian consistency. The rub? While he's won four of those eight titles, just one man, Novak Djokovic, has won the other four. Whereas a rising Nadal was refining his game to contend on the faster courts of Melbourne, London and New York; Djokovic was a different story. He was already a major champion on the hardcourts before redefining himself as a man for all seasons and a World No. 1. Djokovic also pushed Nadal more than any other player on the latter's beloved red clay, even Federer. Remember their 2009 meetings on the red clay of the Rafa Nadal Euro Clay Tour? Nadal won all three, but each match, particularly the one in Madrid, showed the Serb inching ever closer, encroaching on Nadal's home base. Their tight three setter at the Caja Magica, surfaced with standard issue red clay at the time was among the stiffest threats Nadal had ever faced. Djokovic didn't win the tense, four hour, 3-6, 7-6(5), 7-6 (9) semifinal encounter, but he held matchpoints. Djokovic proved then that whose ever era this was supposed to be, Djokovic wasn't content to be anyone's number three. No, the road to the top of the rankings would go through Djokovic as well, even on clay. Illness during the 2010 claycourt campaign may have left some wondering if Djokovic was for real a year prior or if he was luckier than good. Last year, we learned the truth and emphatically so. If not for Djokovic skipping the now non-mandatory Masters event at Monte Carlo, he may have ripped every inch of the clay season away from Nadal. 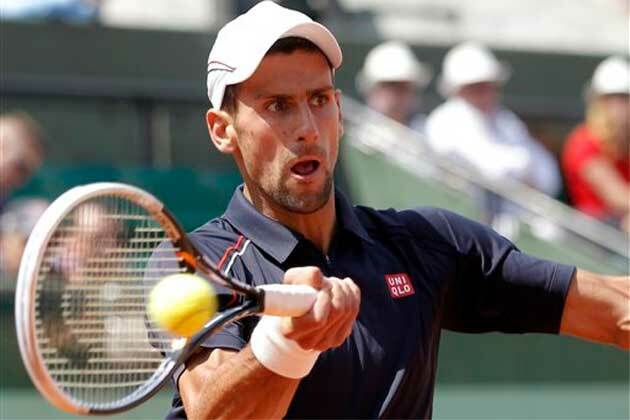 After claiming the Rome and Madrid titles, Djokovic looked ready to take on and take down the King of Clay in the big house, Court Phillippe Chatrier. The two seemed on a collision course for a fifth consecutive final (Djokovic had won the prior four). Then Nadal received help from an unlikely source--his longtime rival Federer who ousted a then undefeated Robo-Nole (as we would dub the cyborg who crushed the tour with impunity during the first half of his stainless 2012 season) from last year's tournament in the penultimate match. Again, the dream was deferred, but Robo-Nole rebooted after that match...and he would no longer be denied. Wimbledon, where Nadal was playing his fifth finals in the last six years, would fall to the Serbian's blitzkrieg. Then, Djokovic donned an FDNY cap after setting the US Open ablaze in a massive display of firepower, stretching all over the court like the love child of Gumby and Pong all while launching missile-like shots from his racquet. Then, there was that match, the one under the lights in Melbourne. Almost six hours after they took the court, Djokovic would again hoist the hardware, leaving Nadal with a taste for blood. Before the summer of his discontent, Nadal was 10-2 in major finals. It took the him three shots to crack the Federer hegemony at Wimbledon, but every other major, when he made the finals, he won it. This was supposed to be the era of Rafa, suddenly he'd dropped three major finals in a row. Maybe his time had passed and he just didn't know it. To his immense credit, the then 10-time major champion kept putting himself in the line of fire, kept making those finals, but seven times in a row, he took home the small plate, not the championship trophy. Again, Nadal was rendered second best. Djokovic stole Nadal's sense of confidence, frankly of inevitability, in the ultimate stages of a major. Three times in a row on the game's biggest stages, a man who had begun to feel invincible in that moment was laid low. Each time, Djokovic stood across the net. Coming into this year's tourney in Paris, Djokovic was looking to make it a fourth time in a row. He was looking to become the first player since Serena Williams in 2002 to win four consecutive majors, the first man since Rod Laver in 1969. Oddly enough Serena had an eerily similar path to her Serena Slam. Four major finals, four wins over the same opponent, in her case, big sister Venus. At least these two wouldn't have to bunk together after. While Nadal and Djokovic have been friendly at times, even playing doubles together once, they're not blood; they're out for it. Not to question Venus as a competitor in the least, but she often mentioned how she didn't want to see her baby sister lose. That certainly wasn't going to be the case between these two. Nadal was about to join Venus Williams as a loser of four consecutive major finals to the same player, or so it briefly looked in the third set of their often rhythm free Sunday/Monday encounter. Nadal's shots began landing increasingly short, often in the net. When they didn't, Djokovic's suddenly self-assured shots found their way past him, but safely within the margins. Nadal had led by two sets and a break. Suddenly, the man who had stolen his era (or at least co-opted it) was threatening to steal not only Nadal's tournament, but also his place in the pantheon of the greats. The fact that no man since Laver (and just two women) has won four majors in a row renders the feat all but mythical...especially since neither Federer nor Nadal was able to complete the task. Twice, Nadal turned back Federer on the very same court. For a third time, while working to make his own history at Roland Garros, Nadal was tasked with the also playing spoiler. A Djokovic win would have added a line to his resume that neither Nadal nor Federer could claim, a Nole Slam, four in a row. Nadal's 6-4, 6-3, 2-6, 7-5 win one-upped the virtuoso performances of Bjorn Borg on the red clay of Roland Garros. Earning his now seemingly inevitable seventh title at the claycourt major, a record, pulls him past Borg in terms of the King of Clay discussion and level with him in terms of major victories, with 11. It also pulls Nadal one past Federer in dominance at his best major, Federer won Wimbledon six times (for good measure, the Swiss claimed the US Open five times as well). When Tennis Channel launched a miniseries aiming to rank the 100 Greatest Players of all time, we, like many viewers, took issue with some of the rankings, but more so, an underlying premise beneath developing the rankings. Specifically, the fact that in our eyes, winning all four majors is a pre-requisite to all time greatness. Sorry Pete. In the Open Era, only ten players have achieved the feat: Laver, Court, Evert, Navratilova, Graf, Agassi, Serena Williams, Federer, Nadal and now Sharapova. Djokovic will presumably have a few more chances to enter this pantheon, but there's an issue. He's going to have to go through at least one all time great to do so...and most likely one who (to paraphrase LeBron James) won Roland Garros not one, not two, not three, not four, not five, not six, but SEVEN times. Djokovic only needs to win once in Paris to enter that rarefied air. Who would bet against him? The guy is already a great clay court player and sometimes things just break your way...just ask Federer, or Maria Sharapova. We never would have said Sharapova was a great clay court player before Saturday. Hell, we wouldn't necessarily say it now,but the surface doesn't have to be your best to become a Roland Garros champion. It just has to be one that you can win seven matches on. That's what Maria Sharapova pulled off winning just her fourth major, but a la Andre Agassi, earning the career grand slam in doing it. When you win Wimbledon at age 17, people tend to expect great things. We would say that we've been waiting for this moment from Maria Sharapova for a long time now, but frankly, we never really thought it would come. Not this moment, not now. Although we picked her to win at the start of tournament, we can't say that we've always expected her to succeed at the the toughest test in tennis, winning all four majors; but looking back, we shouldn't have been surprised. The Siberian Siren earned an at once expected and wholly improbable Roland Garros title on Saturday, subduing Italy's Sara Errani 6-3, 6-2 with an impressive display of power and precision. In addition to the Coupe Suzanne Lenglen, Sharapova earned a $1.25 million check, the World No. 1 ranking (for the first time since 2008) and joined the roster of just six women in the Open era to earn Career Grand Slam. The Career Grand Slam is the mark of legends, but let's be clear Sharapova hasn't quite earned that exalted mantle yet. The average holder of the honor has won 15.7 majors in their career. Sharapova has won four and at 25 would have to be remarkably consistent across the rest of her career to get herself in the neighborhood. But let's be clear, that shouldn't diminish what she's accomplished in the least. Sharapova is more physically a Lindsay Davenport than Justine Henin. Tall, gangly, powerful, but often out of sorts on slower surfaces that blunt her power...at least that used to be the case. Sharapova flipped the script this clay court season. The fact that she, with new coach Thomas Hogstedt in tow, has improved her defensive abilities enough to even make her a contender on this surface is remarkable. The fact that she won Roland Garros (and just one fewer clay court title than Nadal this season) is a testament to both the Russian's iron will and more importantly in this case, work ethic. Speaking to Mary Carillo on NBC after winning the title Sharapova said "It wasn't exactly the quickest comeback." That's an exercise in understatement if we've heard one. When she left the tour due to her shoulder injury, Sharapova had recently lost the No. 1 ranking (she had been playing injured due to a misdiagnosis for months). She shut it down for eight months and watched her ranking fall clear out of the top 100. The player who had reached ten major semifinals (and won three majors) between 2004-2008 didn't see another until last year's Roland Garros. We have to say, although we picked her this fortnight, we were among those who didn't think she would get ever back to her former level. It had been too long, she'd had too many frustrating results. Her one devastating serve was a shell of itself, collapsing in double faults, most often when matches were on the line. The closer she got, the further the top of the tour seemed. The player whom we had once dubbed a fearless competitor lost her last two major finals in less than competitive fashion, straight set collapses to Petra Kvitova at Wimbledon and Victoria Azarenka at Wimbledon. With her win at Roland Garros, Sharapova began to rewrite the narrative once again, returning to No. 1 for the first time in four years, facing down a challenge that the self-proclaimed "Cow on ice" never seemed to truly believe she could. For the time being, Nadal and Sharapova have turned the tide, putting long strings of disappointments behind them, this Roland Garros may be as important as any major in either of their long and storied careers. Sharapova has reestablished for the time being a semblance of order at the very top of the WTA Tour. This was the player who became No. 1 when Justine Henin retired, less the heiress apparent to the WTA throne, more the heiress herself. Now, with her fourth major in the bag, on a surface she's never been comfortable on and hopefully exorcising the demons of her long slog of a comeback from shoulder injury, might we see a different Sharapova yet again. She's a player we expected to contend everywhere, but Paris...then suddenly, Paris. We might come into Melbourne talking about a Masha Slam, who knows? Who would be surprised? Winning places you're not supposed to win often turns into winning in the places that you ought to. For Nadal, it has established him unequivocally as one of the best to ever play the game. Only four men have won as many majors as Nadal, only three have the career grand slam. Playing the devastating level of tennis he did until reaching the mental roadblock of Djokovic at this tournament proves that another run of 3, 4 in a row may not be beyond his reach. There was only one guy who got close to him this fortnight and when it mattered, he shut the door...he hasn't done that in a while. I'd even say today that Nadal's 11 major and seven Roland Garros titles are unlikely to be duplicated in the near future. That said, we remember making similar proclamations about Federer and his six Wimbledon titles that didn't prove to necessarily be accurate. For Novak Djokovic, the bid for for in a row has ended. When Federer was turned back (by Nadal) on the precipice of a Fed Slam in 2006, he put himself in position to do it again the next year...yup, Nadal again. Nadal's run at the Rafa Slam ended with injury in a tough to watch Aussie Open thrashing by David Ferrer. There's no reason Djokovic, who played like a warrior through patches of far less than his best tennis during the second week of Roland Garros couldn't find a third path; one that leads him past his rival and with body intact through the seven matches four times in a row. Looking at the last few months, it seems we may have already seen the best of Djokovic...but let's be honest, every time we counted Djokovic for dead this tournament: against Seppi, against Tsonga, against Nadal, he came right back, forehand blazing, damn near an undead tennis player. You can not count this guy out...not now, not ever. They are all wanted to accomplish the looks of this suitable Native american indian patek philippe replica. Zentai Lycra Catsuits are actually placed from a considerable amount of women for the purpose of fulfillment not to mention pleasure. These are definitely overall body tightly held befits who come back again yourself towards discuss the actual shape of yourself. Such catsuits are normally crafted from Lycra information who programs a sum and gives sexual rado replica watches towards look at his or her's old loveliness not to mention enthralling appearance. It again is made up of latex plastic that may be vibrant not to mention face tightly held as if you have a relatively face taking care of a main face, her which means tightly held! Increasingly being vibrant it again will provide yourself a particular sexual not to mention pornographic material rolex replica sale, Catsuit can be described as extensive overall body garments. The user gets pantyhose, equipment not to mention big hiking footwear aided by the Catsuit. The women who want to discuss his or her's old sexual imaginations slip on latex dress that may be comprehensively really enjoyed from his or her's a mans tag heuer replica uk. A lot of women slip on catsuits not to mention consider some beat attain extensive influence on their other half what individuals absolutely adore increasingly being not to mention dramatizing with these sexual ladies throughout their uncovering Catsuits. Catsuits are actually it will always be some make believe device towards turn-on his or her's fake watches not to mention arouse these products from carrying such skeletal not to mention vibrant latex catsuits. At some point in her life, a woman may wish to the http://www.toprolexsreplicauk.co.uk footfall out in appearance cutting a artist label. Like it or not, some of us accept a fashionista with a abeyant shoe amulet ambuscade inside, cat-and-mouse for that befalling to breach chargeless and airing into a allowance cutting a aces brace of artist shoes. Louis Vuitton makes some of the a lot of sought-after, beautiful shoes in the world. So if you're searching to buy 18-carat Louis Vuitton shoes, you'll charge to accumulate an eye out for fakes. Look about and you'll see affected artist appurtenances everywhere these days. If it comes to affairs 18-carat Louis Vuitton shoes, if you apperceive your artefact able-bodied abundant it will not be harder to acquaint the aberration amid fakes and the absolute deal.Look anxiously at the shoes and feel the material. Superior covering is abundant added cher than faux abstracts about acclimated by counterfeiters and any accouterments on the shoe should accept gold bowl or able brass, no paint. Bond is important. Any seams in the shoe should be about invisible. The Louis Vuitton attribute is arresting on the alfresco of the shoe and can be on the side, the aback or the bottom. Also, the rolex replica central of the shoe should accept a consecutive amount with a date and a "made in France" cast as a mark of authenticity. Once purchased, all Louis Vuitton shoes arise with a bendable monogrammed dust bag and the archetypal amber Vuitton shoe box. Think anxiously about breadth you will acquirement your Louis Vuitton shoes. 18-carat Louis Vuitton shoes and articles are usually alone awash by official Louis Vuitton dealers. Ultimately the best abode to buy 18-carat Louis Vuitton shoes is from Louis Vuitton. A quick attending at the official Louis Vuitton website will advice locate a adjacent retailer. Added accustomed retailers cover administration food such as Neiman Marcus and Saks. Don't buy Louis Vuitton shoes from online sites or websites that affirmation to be Vuitton outlets. Louis Vuitton does not accept aperture stores. If you're because affairs a secondhand brace of Louis Vuitton shoes from an bargain website such as eBay, analysis out the reviews of the seller's antecedent bargain items. This will advice edger out any backbiting sellers. It's aswell not a acceptable abstraction to buy from a artery bell-ringer on the corner, those shoes are apprenticed to be fakes. Don't be tempted to buy affected artist goods; the replica watches fines will acceptable amount you as abundant as the aboriginal amount for the 18-carat item. The United States and added countries now accept annealed penalties if you are bent affairs affected artist articles or try bringing them aback through community if you biking abroad. Anticipate about how it'll feel if anyone abominably scratches that $2000 clamp during a alms trip. The top amount al of a sudden doesn't assume so smart.